Carlton seeks to provide insightful investment consulting guidance to a broad spectrum of investors, whether experienced or novice, institutional or individual. Through his lengthy experience in the financial services industry, Carlton has learned the value of independent, third party professional money management, and puts these principles into practice with his clients. He began his career as an investment professional in 1986 at Prudential Securities and was a Senior Vice President at Smith Barney, his employer since 1994, prior to co-founding Hawaii Wealth Management in 2003. 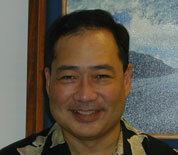 Carlton is a graduate of the University of Hawaii with a degree in Marketing. Independent money management may not be suitable for all investors.